Sergio Aguero led City to a stunning win. 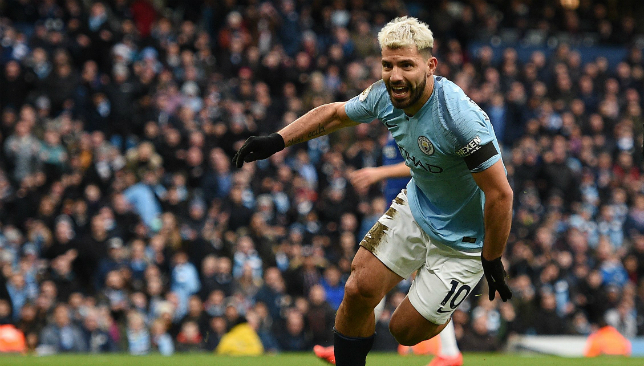 Manchester City sent a warning to title rivals Liverpool with a stunning demolition of Chelsea, with Sergio Aguero’s record-equalling 11th hat-trick leading the reigning champions to an incredible 6-0 victory. The result saw City retake the lead atop the table, three points above Liverpool having played a game more, while Chelsea dropped to sixth. Here’s how the players from both sides rated in a memorable Premier League clash. Ederson 7 – Made a wonderful save to tip over an equally-superb volley from Gonzalo Higuain but was kept relatively quiet as City’s attackers came to the fore. Kyle Walker 7 – An assured performance from the England full-back as he kept Chelsea talisman Eden Hazard subdued. John Stones 7 – Was regularly able to disrupt Chelsea’s rare forays forward. Aymeric Laporte 7 – Chelsea’s attacking might was strangled by his and Stones’ interventions. Alexander Zinchenko 8 – A tireless performance from City’s left-back, whose cross allowed Raheem Sterling to complete the scoring. Ilkay Gundogan 7 – Took his goal well and rarely conceded possession, justifying his selection ahead of David Silva. Fernandinho 7 – Usual busy presence in the centre of midfield. Kevin De Bruyne 7 – His quick thinking from a free-kick freed Bernardo Silva on the right, leading to City’s opener. Starting to show signs of his best form after an injury-plagued season. Bernardo Silva 8 – Gave Marcos Alonso a torrid time on Chelsea’s left-hand side. Was regularly in the thick of the action and provided the assist for Sterling to open the scoring. Sergio Aguero 9 – Conspired to miss from two yards but proved his class by expertly finding the top corner from distance. Scored twice more for his 11th Premier League hat-trick. Raheem Sterling 9 – A dynamic performance saw the England forward book-end the scoring while he won the penalty that helped Aguero bag his third. Gabriel Jesus (on for Aguero, 65) 6 – Had a couple of opportunities to get on the score sheet but was unable to take them. Riyad Mahrez (on for De Bruyne, 68) 6 – Gave City fresh legs in the latter stages. David Silva (on for Fernandinho, 75) 7 – Opened up Chelsea’s defence for Zinchenko to tee up Sterling’s second. Kepa Arrizabalaga 5 – Probably should have done better with Gundogan’s low strike but was relatively blameless for the City onslaught. Cesar Azpilicueta 5 – Conceded the penalty after tripping Sterling, who gave his Spanish marker a tough afternoon. Antonio Rudiger 5 – Unable to contain the relentlessness of Aguero. David Luiz 5 – Was powerless to stem the tide. Marcos Alonso 5 – Unable to handle the creativity of the indefatigable Bernardo Silva, especially in the first half. N’Golo Kante 5 – A below-par performance from the Frenchman, who sometimes found himself bypassed. Jorginho 6 – Found himself overrun at times although he was always a willing runner. Ross Barkley 4 – Inexplicably headed towards his own goal which allowed Aguero to score his second and City’s third, effectively ending any hope of a comeback. Pedro 5 – A largely anonymous display from the Spaniard. Gonzalo Higuain 6 – Long-distance volley well saved by Ederson but was unable to impose himself. Eden Hazard 5 – Caught napping for City’s opener, allowing Bernardo Silva to latch on to De Bruyne’s free-kick, and his mazy runs often came to nothing. Mateo Kovacic (for Barkley, 52) 6 – Brought on to shore up Chelsea’s midfield. Ruben Loftus-Cheek (on for Pedro, 65) 5 – Could not make an impact. Emerson (on for Alonso, 73) 6 – Tidy enough from the Italian. Liverpool may have enjoyed a convincing 3-0 win over Bournemouth on Saturday but they will be more nervous than ever now as a rampant Manchester City side are in hot pursuit of the Premier League title. 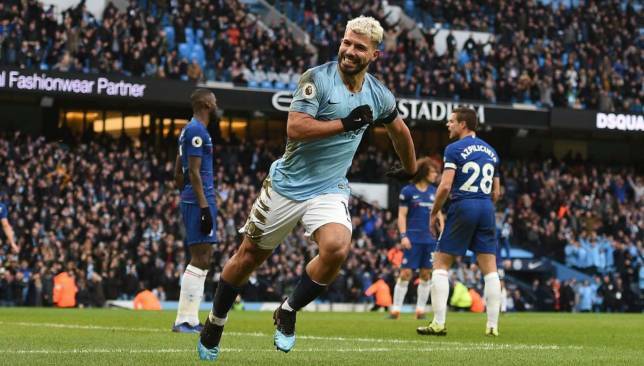 The reigning champions demolished an insipid Chelsea 6-0 at the Etihad Stadium with Sergio Aguero scoring his 11th hat-trick in the English top flight – levelling Alan Shearer’s record. Maurizio Sarri had no answer as Raheem Sterling opened the scoring four minutes in after Chelsea’s defence switched off – and remained that way. Two from Aguero and one from Ilkay Gundogan left the visitors trailing 4-0 after 25 minutes. The Chelsea boss didn’t seem to make any notable changes in strategy at the break and Aguero converted from the spot early in the second half before Sterling rounded off the scoring 10 minutes from time. Here, we grade the performances of both sides in our report card. There’s plenty to choose from but we’d be remiss not to highlight Aguero’s frightening form. The Argentine missed an absolute sitter – probably one of the most glaring of his career – early on when he failed to slot Bernardo Silva’s excellent pass across goal into an empty net from close range. His response? A thumping effort from 25 yards to really put City in control before going on to complete his second hat-trick in three games and level Mohamed Salah at the top of the scoring charts with a tally of 17. Aguero looked disappointed to come off in the 64th minute with the damage done and understandably so, as Chelsea were there for the mauling. He was a nightmare for the centre-backs to pick up as he dropped off and ran in behind intelligently. His contribution off the ball was also commendable, helping to cut off passing lanes and keep Chelsea pinned back, forcing turnovers. There’s little room for error when you’re playing the champions, especially with the form they’ve been in lately, but Chelsea’s casual defending cost them dearly. For the first Marcos Alonso lazily motioned – to no one in particular – to pick up Bernardo out wide from a free-kick while he ambled into the crowd in the middle. Unsurprisingly, his team-mates didn’t heed his warning and the Portuguese took full advantage. Sloppy misplaced passes inside their own half were responsible for other goals, including a passage of play that saw a poor David Luiz headed clearance woefully nodded back by Ross Barkley for a gleeful Aguero to bag his second. Then, a clumsy foul on Sterling – who had been dribbling past players for fun – from Cesar Azpilicueta saw the Argentine score City’s fifth from the spot. In many ways, Chelsea’s play is the mirror image of City’s philosophy, devoid of one crucial element – intensity. With a possession-heavy style, there’s a fine line between ponderous and irresistible and City are regularly on the right side of it, Chelsea aren’t. The other aspect of their passing game that Sarri failed to implement in this fixture is the ability to break through the lines. The away side were often boxed in as their midfielders came short and they tried to play their way out from the back, with City doing well to cut off passing lanes and repeatedly winning possession. When the hosts played out from defence, the likes of Kevin De Bruyne and Ilkay Gundogan were positioned up field. Centre-backs John Stones and Aymeric Laporte were positive with their passing, fizzing the ball into the midfielders’ feet. That saw City instantly break through Chelsea’s press and earned them plenty of inviting scenarios against their exposed back-line. They started like a house on fire and took the game away from the opposition in no time. The passing was slick, movement mesmeric, pressing relentless and defending dominant. City are quite simply playing like champions. 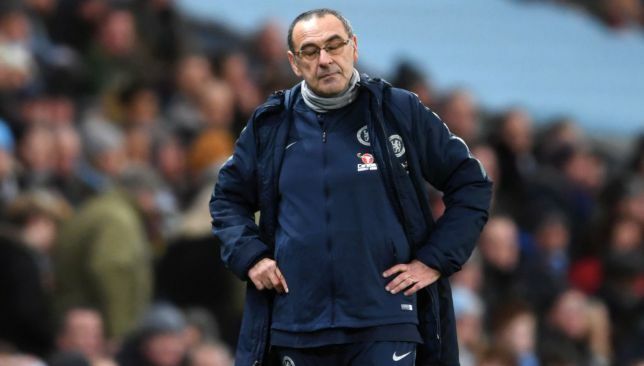 The flaws in Sarriball were evident early on and as the season has progressed teams have learned how to expose them. 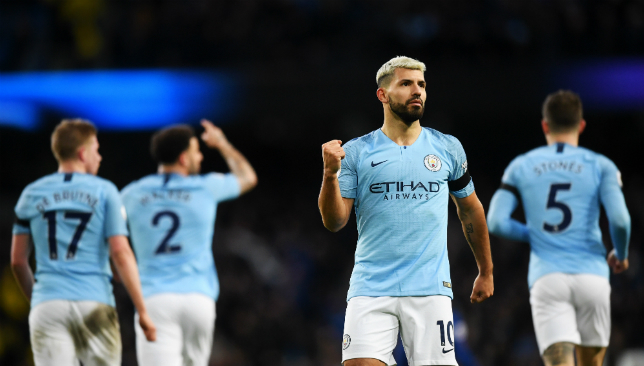 City were ruthless in their efforts and Chelsea – as ever under Sarri – had no Plan B.
Sergio Aguero equalled the record of Premier League hat-tricks held by Alan Shearer against Chelsea. 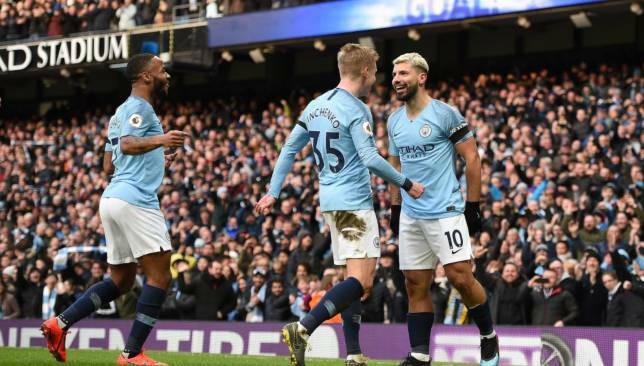 Manchester City put in a stunning performance to thrash Chelsea 6-0 on Sunday, and it came thanks to an historic day from their star striker. Sergio Aguero scored another hat-trick, his 11th in the Premier League – which now puts him level with Alan Shearer in that particular tally. Just as sweet a milestone, if not sweeter, was that his three goals made him City’s highest-ever league goalscorer. Here’s a closer look at Aguero’s display. Hat-trick against Arsenal last week. Hat-trick against Chelsea here. Aguero is in unstoppable form at the moment, and because of that, so are his team. No one would have expected City to host Chelsea and win 6-0. But thanks to their star striker, that’s what happened, as the Argentine scored a peach, a tap-in, and a penalty to lead his side to victory. Meanwhile, the hat-trick adds a delicious sub-plot to the title race. Aguero is now level with Liverpool‘s Mohamed Salah atop the league goalscoring charts. Which player, and team, is going to come out on top? Aguero’s second was a great strike, but his first underlined the key aspect of his game: he’s arguably the greatest goal-poacher in world football at the moment. Simple finishes aren’t always easy – more on that later – but just the fact that he’s able to get in position for them, despite his reputation commanding added defensive attention, is remarkable. The striker actually had the fewest touches of any player in City’s starting XI, only 36. And yet he emerged three goals. His ability to find space in the box is incomparable. Aguero’s only mistake all game was a glaring one. How did he miss an open goal from two yards out? It was a collector’s item made even more redundant by what came after, which included a header he thumped against the bar in the second half. Could have scored five, only managed three. Not Aguero’s greatest performance, then? 🔥🔥Double that of any other player in the competition. The best big-game player in the Premier League? The best player, period? The superlatives are going to keep flowing for Aguero and well they should. Consecutive hat-tricks in games against the ‘Big Six’ is an incredible feat, even more so when the two games are only a week apart. His inexplicable first-half miss is the only reason this performance hasn’t rated a perfect 10. Although that only serves as a reminder that he could easily have turned this hat-trick into a five-goal display.